Professor Yuval Neria, Professor of Clinical Psychology at Columbia University, Departments of Psychiatry and Epidemiology, and Director of Trauma and PTSD at the New York State Psychiatric Institute (NYSPI), was the Guest Speaker at the November 2013 FIDV Board meeting. Prof. Neria is involved in developing and testing novel, neuroscience-informed treatments for PTSD. 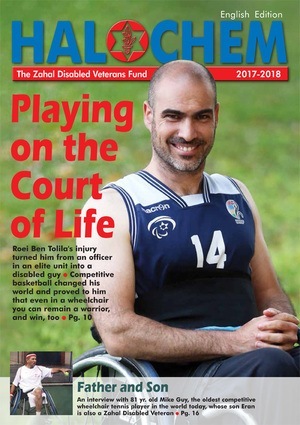 He himself is a longtime member of Beit Halochem Tel Aviv, and thus is very familiar with this organization and how it serves disabled Israeli veterans. Prof. Neria grew up in Israel, and at the age of 18, he joined the Israeli army. He participated in the 1973 Yom Kippur and 1982 Lebanon wars. He was injured in the Yom Kippur War, and at the age of 22 was awarded the Medal of Valor/ GIBOR ISRAEL, the highest decoration for combat bravery in Israel. Having personally experienced war, and the longtime consequences, Dr. Neria now is exploring how to heal some of the most serious injuries soldiers experience – the ones that are on the inside. He has led, and collaborated on, numerous epidemiological, clinical, and neuroimaging studies in posttraumatic stress disorder (PTSD), funded by the National Institute of Mental Health (NIMH), NARSAD and private foundations since 2002. Currently, at Columbia and NYSPI, he is focused on identification of brain and behavioral biomarkers of PTSD. By using Functional Magnetic Resonance Imaging (fMRI) to identify brain circuits underlying PTSD, Dr. Neria and his team are able to identify brain and behavioral markers of deficient fear conditioning and extinction, and probing brain based markers of clinical improvement in response to PTSD treatment. Aside from his scientific work, Prof Neria is one of the 50,000 served by Beit Halochem, which he notes is “the system in place that helps to support not only the veteran but the entire family in Israel.” At Beit Halochem, through rehabilitation therapies, family and social programs, and sports training, there is a feeling created of safety, and of being one part of a big Family. This is key piece in overcoming the physical scars and losses, Prof. Neria noted. Supporting them in every phase of rehabilitation – from sport training through scholarship assistance – is integral to their success. Prof. Neria sees the difference between Israeli and American wounded: In Israel, veterans are part of the general society, community and family. In America, disabled veterans can be left without a safety net and isolated. Often even the V.A. Hospitals weren’t and aren’t ready to cope with the extremity of personal and physical losses, wounds, and necessary therapies. The Board and guests who listened closely to Prof. Neria were impressed by his outstanding credentials, his devotion to helping other wounded soldiers regain confidence, and his deep understanding of the critical role played by our Beit Halochem centers in the recovery and successful re-entry of disabled veterans into new lives.